There are many tools available online, which can let you track, monitor, automate or help you in any other way during your social media marketing campaign. May be you need to know the trends of the moment and you want an inspiring idea to create your next blog post or you want to manage one of your social media account, automating some process that otherwise will take you a big part of your time. I am sure you will find something interesting and useful in this list. Let’s see the 11 free online tools for blogging and social media marketing. Followerwonk provides valuable information on your Twitter account with the ability to compare your followers with those of other users. This is perhaps one of the most useful tools. 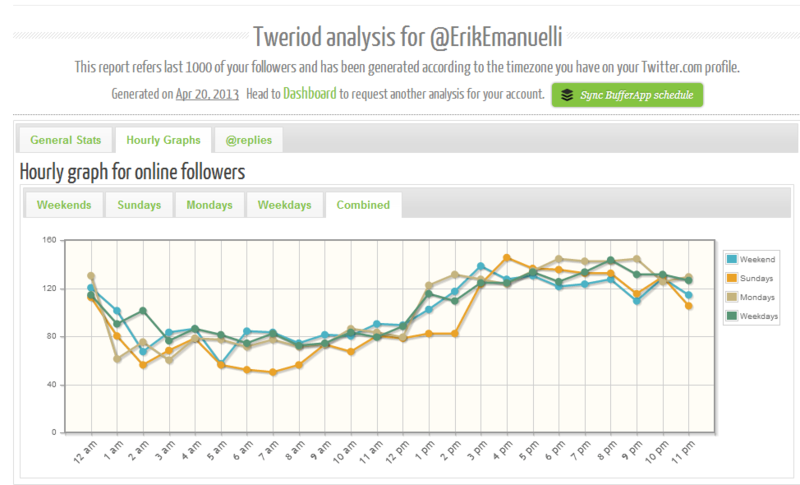 Tweriod analyzes your account with a particular attention to the moments in which you generated more engagement. In this way you will know what is the ideal time to tweet and you will reach the largest possible audience. 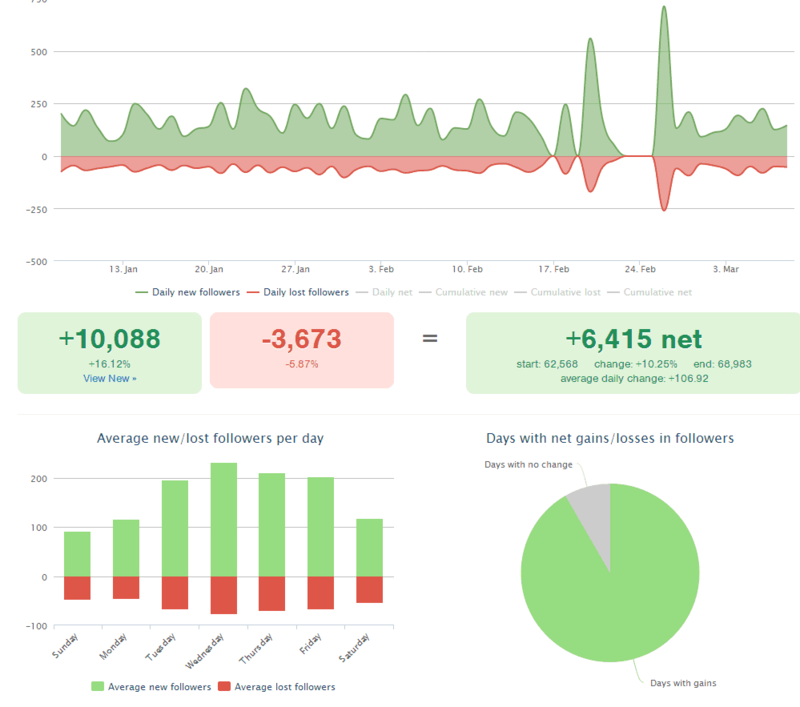 This useful site lets you manage easily your Twitter followers. It’s free up to 100 daily actions. 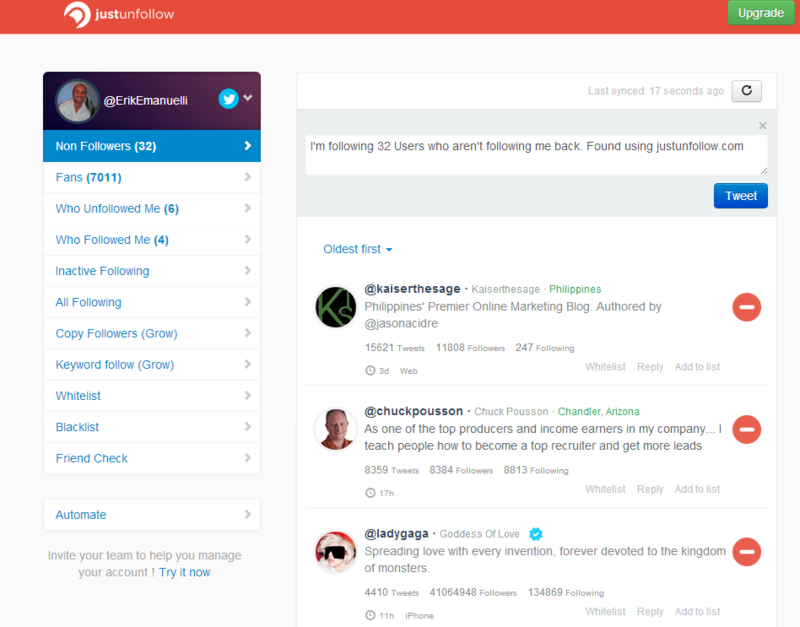 I’ve been using JustUnfollow since a good time already in order to clean up my inactive followers. 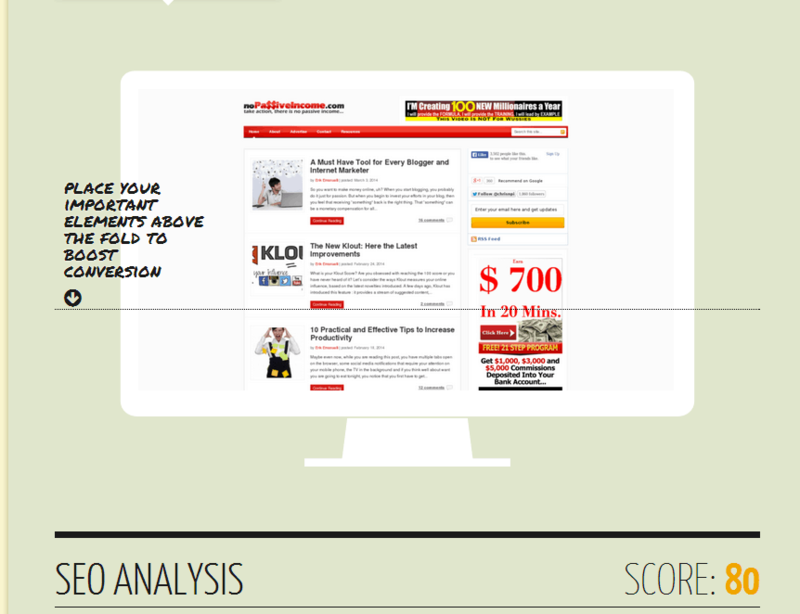 C’mon, is there any blogger or internet marketer who do not know and use this amazing site? 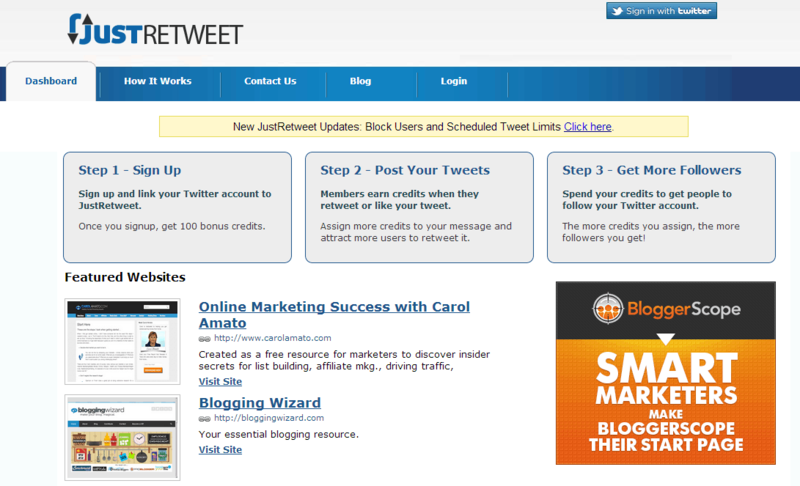 JustRetweet is fantastic if you need to expand your social media audience and promote your content. Discover the influence you have on Facebook with an infographic created instantly just for you. 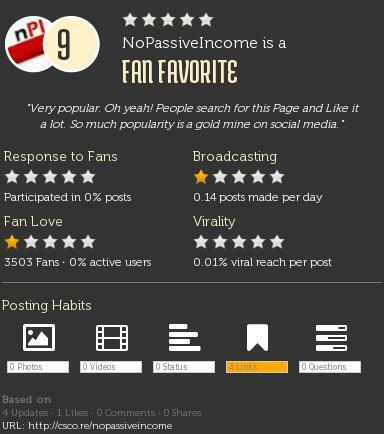 Conversation Score, after analyzing your page, will provide information regarding your relationship with those who follow you, your habits, the percentage of likes in your posts and other useful statistics. LikeAlyzer analyzes your Facebook page and gives you advice on how to improve your presence and your appeal, relying on dialogue, timing and posts that you have posted. Open Site Explorer is basically a search engine for links. It enables you to find all the sites that link to your website (or anybody else profile, if you are curious). When someone is linking to you, it may give you huge SEO benefits, depending on some crucial factors. This site can help you check other blogs in order to establish relationships within your niche – or to just keep an eye on your competition! Google Trends is a very useful tool when you have to write a new post. In order to gain as more visibility as possible, it is suggested to write about something which is the trend of the moment and this tool lets you know what topic is hot on the web. 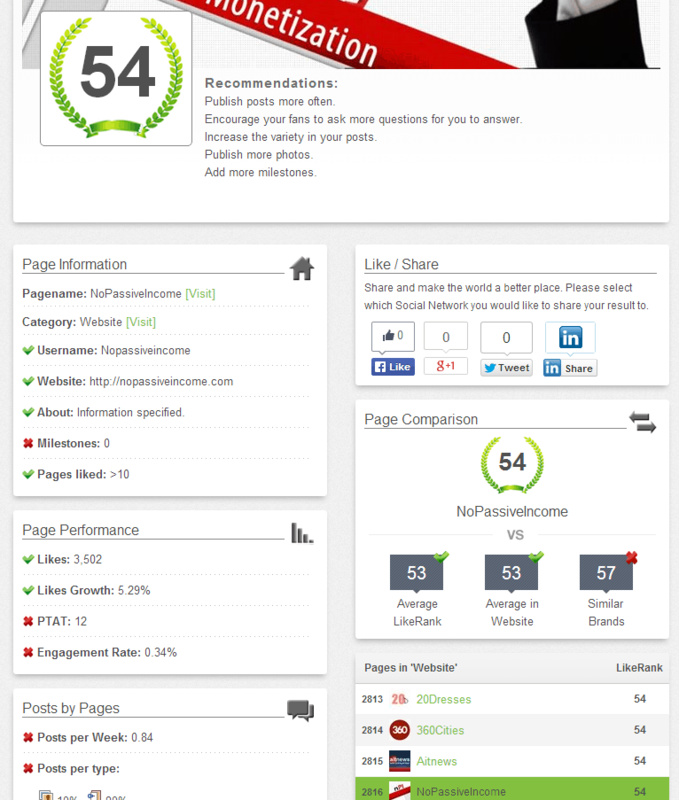 Quicksprout scrutinizes your site from top to bottom, giving you precise details on SEO, SMO and comparisons with competitors. Content Idea Generator, rather than a real instrument, is a title generator of posts ready to make you smile. Simply enter a keyword in the box and you will get a nice title with a lot of sarcastic comments. You can enter here the link to the website you are trying to reach immediately, in order to get a response on its status. I hope that you will find useful this list of tools that you can consider for your blogging and social media marketing. Do you know any other tool you would like to share? Please let me have your feedback in the comments below, thanks! All the tools you mentioned here are very good. 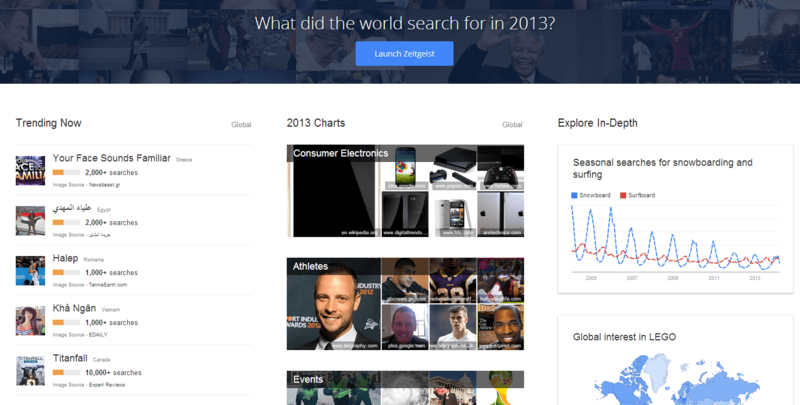 I’ve a good time with Justunfollow and Google trend and many others. Thank you so much for compiling this list, i have never heard of Tweriod and it is a lovely tool! What’s an amazing post Bro! These all Free Online Tools are really much valuable for Blogging and Social Media Marketing. All the experienced Blogger take the advantage of these online tools effectively, after reading this article newbies will start using too. I was familiar with only 5 tools from this list, and now i got 6 more useful tools from here that will help me a lot. I am happy you enjoyed the post and learned something new from this list. I hope you will find some interesting and useful tools from this list. Thanks for compiling this list together, is really helpful and to be honest, I only have heard and use just few of them, most on this list are new to me. But I’ll like to add one Twitter tools I used almost every day – unfollwers.me. This twitter tools sent you notification via email every day about users who just unfollow you and if there’s no one in the day that unfollow, it reply 0 unfollow for the day. Thanks for adding that one, Shamsudeen. I am sure it’s very useful. First time on your blog and found great list. I only have used Google trends and Open site explorer, after your recomendation in above post i checked out Content Idea Generator, Everything i searched in it made no sense. Either i was using it wrong or something else can be the reason. Can you suggest me something…. You are using it fine, Ajay. It’s a nice share. I am using 5 tools out of these 11 and Just retweet is my favorite among all of them. It’s a nice tool to get retweets which eventually helps to get more traffic. I’ll try my hands on new tools too. Glad to see you found some new things, Kuldeep. Smart list Erik! Thanks for sharing with us. The post about Online Tools for Blogging and Social Media Marketing is very awesome i found all tools very useful. This is a great list of tools, I am only familiar with Justretweet and Tweriod. I will check other tools specially Facebook tools. The tittle maker tool is great a giving you tittle ideas or even inspiration for writing a new post. I hope you’ll find the other tools useful. Conversation Score is my favorite one to do with my Facebook, sometime is really cheer me up when i can see how much i can influence but most of time is knock me down, LOL. thanks so much for your information and i absolutely try the rest. A list of very useful tools this is! These tools will definitely come handy and help boost productivity. Lots of them are new for me and few are familiar. I’m a user of JustRetweet. And it makes social sharing a cakewalk for me. It is really easy to use and makes the task of social promotion of posts real easy. Downforeveryoneorjustme is also a fantastic tool that I use sometimes. Majority of the tools are unexplored by me. Looking at their uses, I feel I can make good use of them. Happy to see you found the list of tools useful. I could use the JustRetweet tool. Just unfollow caught my eyes than the other ones as the name makes it unique.They are all very good that I’ve learnt reading.But reading and using aren’t the same so I need to give them a try and next time I will be able to say how they really work.Thanks for sharing these with all of us. Thanks for your feedback, James. Very informative post Erik! Learned a lot and will definitely be looking into many of these tools. Nice to have a comprehensive list with great descriptions of their uses. Glad you liked it, Sagar. yet another big information. I appreciate your writing skill. Moreover, every information you provides is surely necessary for me. However, i implements some some of them on my work. Ofcourse, it proves to be beneficial for me. Thanks for sharing such great knowledge. Really appreciable work. Great list of tools. All of these are really useful, I like quicksprout, its useful to run a website through the analyzer to see where you can improve it. Glad you enjoyed the list, Mike. Thanks for your visit and comment here, Chery. you’re right, JustRetweet is just great! Great list of tools, I am going to start trying out a few of these. Glad you enjoyed the content, Dave. Great list, I wasn’t aware of most of these tools. Thank you. Thanks for your comment, Tom! Hi Erik, these are great tools you shared here, i have used very few of them in the past and they were awesome i must say. Thanks for your kind feedback, Emebu. Glad to see you enjoyed the tips mentioned in this post! Thanks for the useful tools – “Down for everyone” was very timely as someone was telling me my site was down – well it isn’t apparently. I enjoyed the title generator very much – that’s an area I really struggle with, so sure to come back to that one. I always try to add at least one useful resource for each post I write. It seems to work, as readers appreciate it. Good to hear you found the article interesting, thanks for commenting. Have a great week, Joy! thanks for sharing your views here.